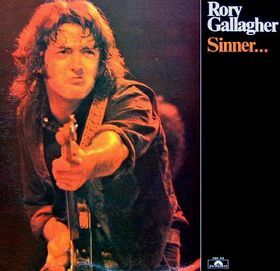 This Irish brew boils with the hard rock, blues, and slide electric guitar that are Rory’s forte. He's dirty and fast and clips each note about as gently as dull nail clippers chew off hangnails — it's painful, but that ragged landscape is really interesting. Gallagher’s searing vibrato browns the edges of flaming phrases that writhe and crumple up around each other. His screeching slide solo on “Sinner Boy” displays fantastic phrasing. But on Side 2 of this ten-cut LP, he raises his shades and lets us look in on some of his milder emotions. He is playful in his acoustic folk blues guitaring (“Don't Know Where I'm Going”); he is melancholy and even lyrical in his acoustic jazz-blues work (“I'm Not Awake Yet”). All in all, this is another fine album from a multi-talented musician (he handles vocals, sax, mandolin, harmonica, and electric and acoustic guitars). If it weren't for the wonders of modern studios, Rory would need four months and six hands to demonstrate his outlandish pizzazz.